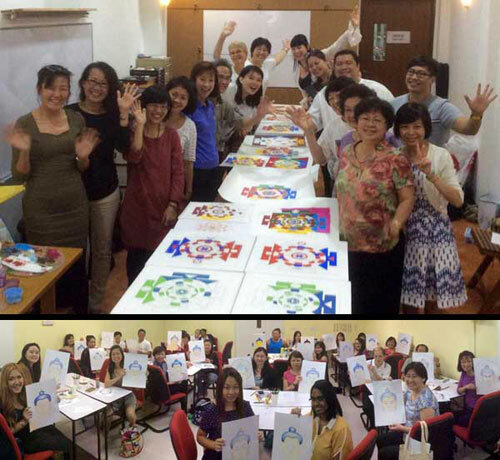 This year’s subject in Singapore -that I taught at the Buddhist Library- was drawing and painting the Mandala of the 5 Elements of Earth, Water, Fire, Air and Space. It was a course over 2 weekends this time where the students to draw the mandala in the first weekend (and got to know all about the meaning and background of this mandala), and started to paint it according to tradition in the subsequent weekend. learned how to draw and color (with colored pencils) Buddha’s Face. We were again working with the right proportions of the deity and the tradition, clearly explained and guided by me. Both experienced and unexperienced drawers learned more about Tibetan Buddhist Art and its symbolism, that they applied with a lot of enthusiasm and joy. 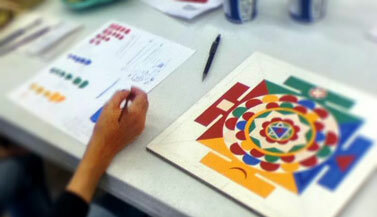 I regularly offer Mandala drawing and painting classes. 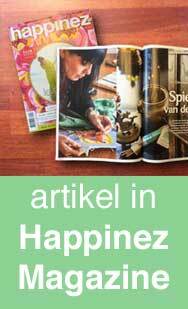 To check if there’s one coming up you can go to the Upcoming Classes & Workshops section.